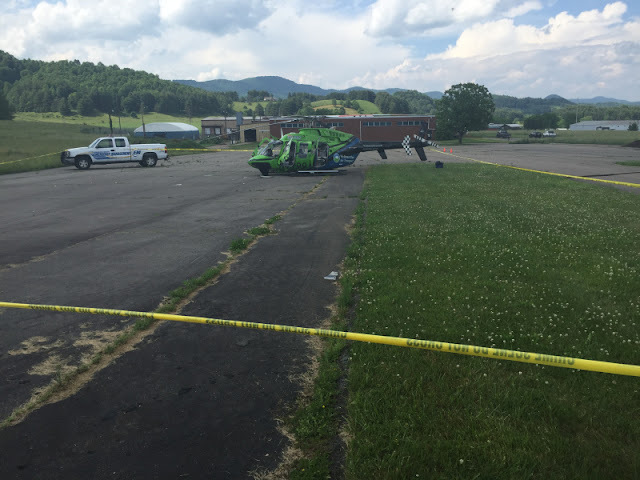 On June 3, 2016, about 1345 eastern daylight time, a Bell 407, N4999, operated by PHI Air Medical, was substantially damaged during a forced landing to a parking lot, following a partial loss of engine power during initial climb near Mountain City, Tennessee. The commercial pilot incurred minor injuries. 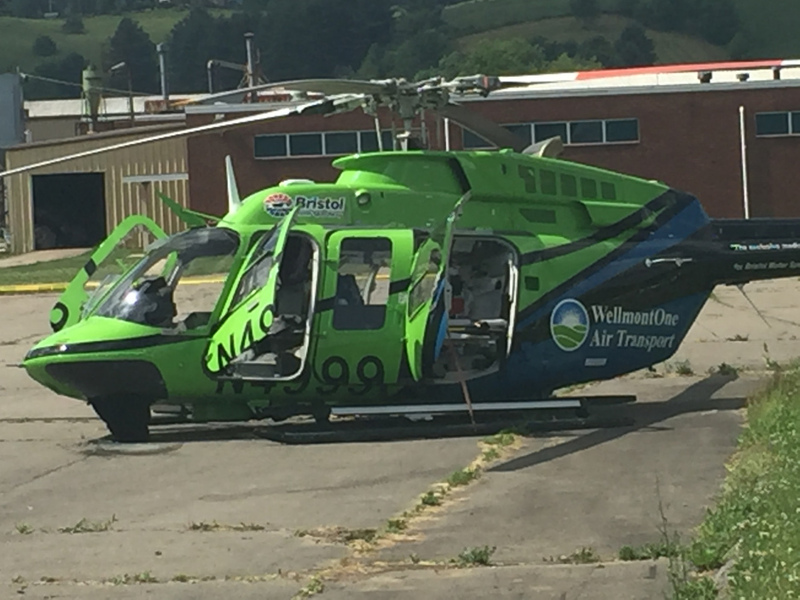 The two crewmembers and one patient were not injured. 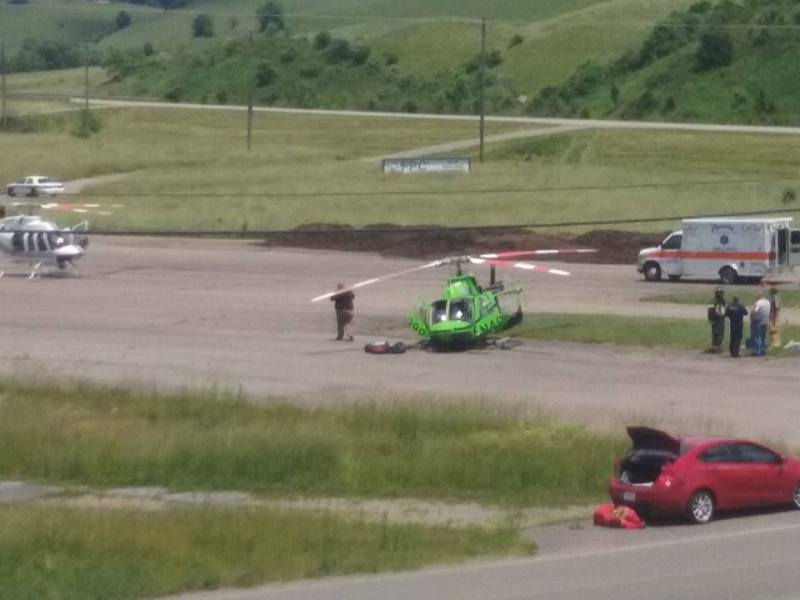 The on-demand air medical flight was conducted under the provisions of 14 Code of Federal Regulations Part 135. 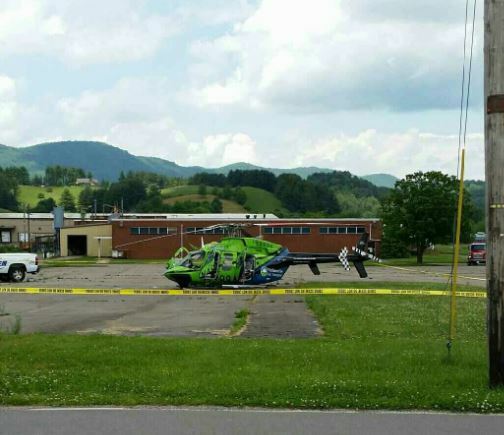 Visual meteorological conditions prevailed and a company flight plan was filed for the flight that originated from the parking lot; destined to Johnson City Medical Center Heliport (TN91), Johnson City, Tennessee. The pilot stated that during initial climb, about 125 feet above ground level, he heard a loud "bang" that was accompanied by a left yaw and rapidly increasing measured gas temperature (MGT). The pilot advised the crewmembers that he was rejecting the climb and landing immediately. The pilot further stated that he had to maneuver the helicopter right to avoid ground personnel, level the helicopter with cyclic control, and used all available collective to cushion the landing. The helicopter was equipped with a Rolls Royce (Allison) 250-C47B, 650 horsepower turboshaft engine. Examination of the helicopter by a Federal Aviation Administration (FAA) inspector revealed that it landed hard, which spread the skids and resulted in substantial damage to the fuselage. Review of data downloaded from an engine monitor revealed that during the accident takeoff, the MGT increased beyond maximum for takeoff while the power turbine rpm decreased. Examination of the engine at the operator's facility revealed a partial separation of the compressor diffusor, which allowed intake air to leak prior to combustion. The compressor diffusor was forwarded to the engine manufacturer's facility for teardown examination under the supervision of an FAA inspector. Examination of the compressor diffuser revealed that a portion of the aft plate had separated near a braze joint. Review of engine manufacturer specifications revealed that the aft plate should have been a single component and not two components joined together by a brazing process. Maintenance records revealed that the compressor diffusor had been overhauled by a repair facility and installed on the accident helicopter about 98 hours of operation prior to the accident. According to the FAA principle maintenance inspector (PMI) of the repair facility, a machinist had joined a second ring to the compressor diffuser aft plate using a brazing process. There was no approval (neither through the engine manufacturer nor the FAA) for that process and it is possible that the machinist performed the procedure to correct a mistake he had made during a dimensional shim repair, which was approved through the FAA designated engineering representative (DER) program. The machinist no longer worked for the repair facility and had left the company prior to the accident. Further review of the repair facility by the FAA PMI revealed that they had authorization through the FAA DER program for approximately 4 years to repair compressor diffusers. During those 4 years, the repair facility had performed repairs on 52 other compressor diffusers. Most of those were common repairs to vanes, with 17 being dimensional shims to the aft plates. Review of the other 17 similar repairs revealed that the machinist in question had not worked on any of those. According to the Quality and Engineering Manager at the repair facility, ultrasonic testing also failed to identify the unapproved repair. An immediate corrective action for the repair facility was to suspend dimensional shim repairs indefinitely. The repair facility also ensured that their three-tier approval process (engineering, quality and management) was required for any fixture, tooling, drawing, or process before it was performed and that all necessary personnel were trained in that method. The pilot stated that during initial climb, about 125 feet above ground level, he heard a loud "bang" that was accompanied by a left yaw and rapidly increasing measured gas temperature. The pilot advised the crewmembers that he was rejecting the climb and landing immediately. The pilot further stated that he had to maneuver the helicopter right to avoid ground personnel, level the helicopter with cyclic control, and used all available collective to cushion the landing. The helicopter was equipped with a Rolls Royce (Allison) 250-C47B, 650 horsepower turboshaft engine. Examination of the helicopter by a Federal Aviation Administration inspector revealed that it landed hard, which spread the skids and resulted in substantial damage to the fuselage. Initial examination of the airframe and engine did not reveal any preimpact mechanical malfunctions; however, the engine was retained for further examination.